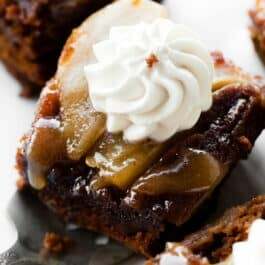 This boldly spiced upside-down pear gingerbread cake combines your favorite holiday spices with juicy pears, brown sugar caramel sauce, and cool whipped cream. Serving warm brings out the flavors AND makes this a quick holiday dessert. I’m convinced you need no other cake this holiday season. Today I’m serving you boldly spiced gingerbread with buttery brown sugar soaked pears and a dollop of fresh whipped cream. 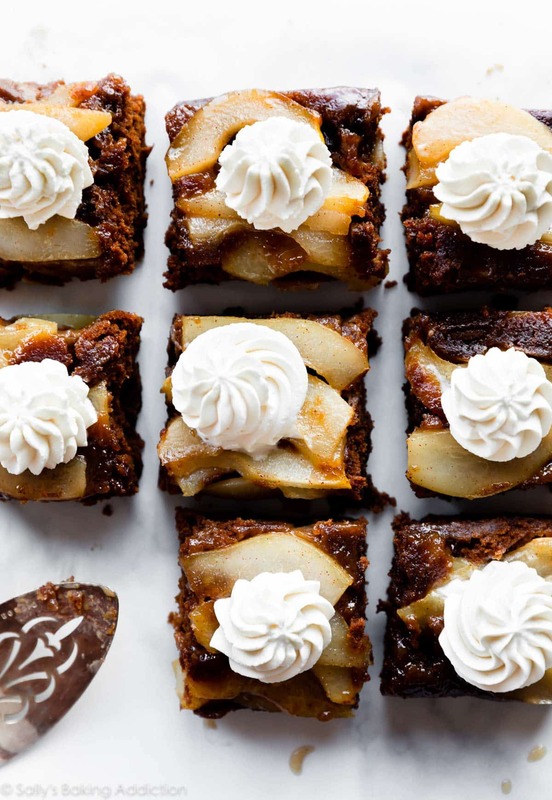 There’s plenty of ginger, plenty of cinnamon, plenty of pears, and absolutely zero apologies. Ready to indulge? 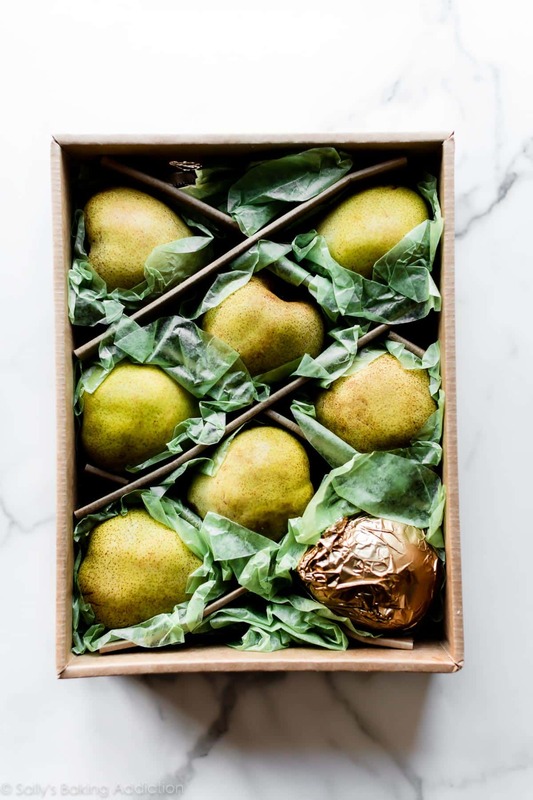 I have the pleasure of working with Harry & David on two recipes this holiday season– both highlighting their hand-picked Royal Riviera pears. These buttery pears steal the attention no matter which dish, dessert, or spread they’re in. 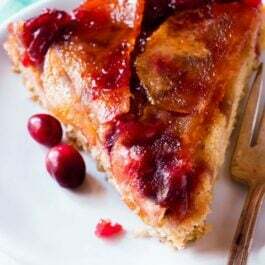 Cranberry Pear Crumble Pie, shared just the other week, is no exception. The cranberries and brown sugar crumble are both fantastic, but the high quality pears win 1st place. Their texture is unbeatable and dare I say that pie beats all other Thanksgiving pies!! Even you, pumpkin pie. I carried a similar flavor profile into my 2nd recipe for Harry & David. 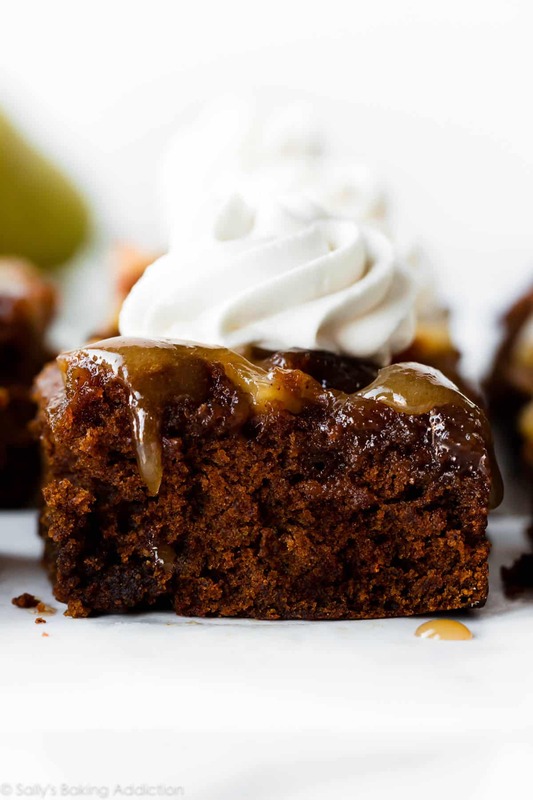 I’m especially excited about this recipe because I used my gingerbread snack cake as the base, both a personal and reader favorite. 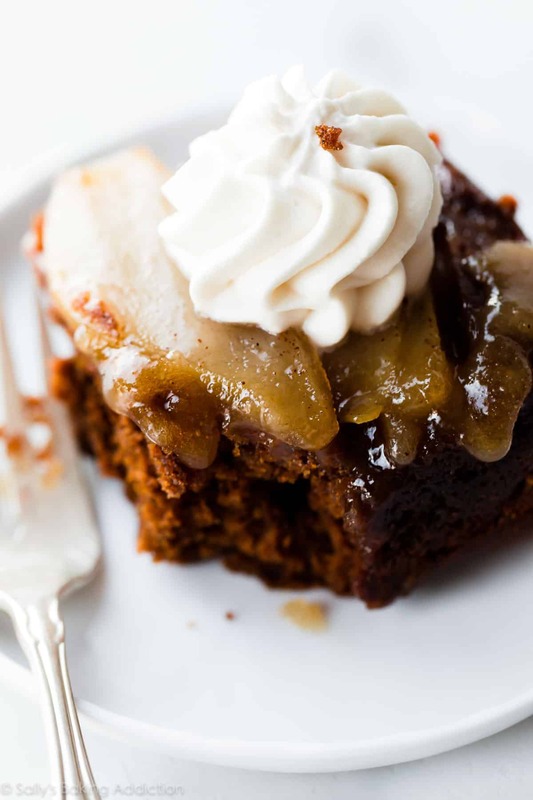 There are 3 parts to Upside-Down Pear Gingerbread Cake. The gingerbread cake is soft, moist, and robust– the virtual opposite of any dry or bland gingerbreads you’ve had before. It’s made with the best ingredients in your pantry: molasses, brown sugar, ginger, cloves, vanilla extract, and cinnamon. If this cake doesn’t scream HAPPY HOLIDAYS, I’m not sure what does. One special note about this gingerbread batter: hot water. It’s an odd ingredient in cake, but there’s a reason for its addition. Molasses is very thick and very sticky. Its consistency makes it very difficult to seamlessly mix into cake batter. When mixed with hot water, its viscous consistency loosens. Problem solved, cake success. 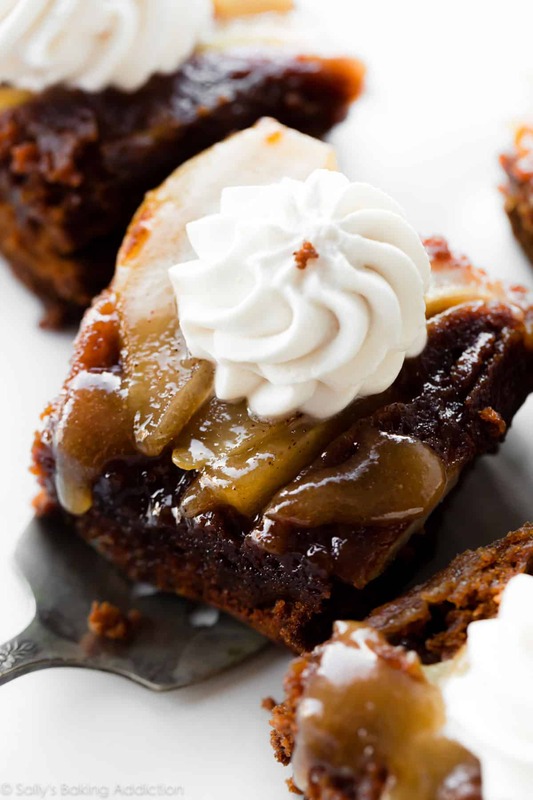 Spread the gingerbread batter over the pear topping. You can bake this gingerbread in a variety of cake pans. My directions for varying pan sizes are in the recipe notes below. Whichever size pan you use, the trick to upside-down cakes is to let them cool for only 10-15 minutes before inverting over. 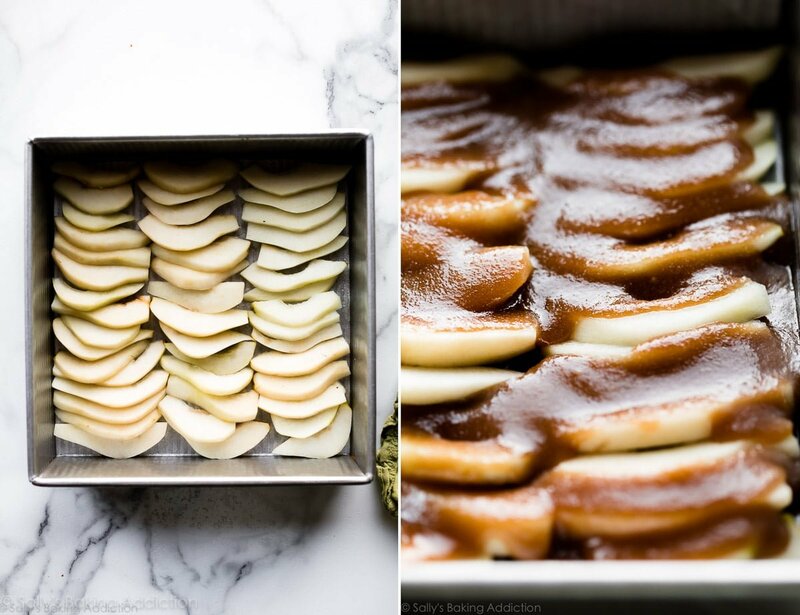 Once flipped over, lift the baking pan straight up to reveal all those luscious pears. A topping is so good, it glistens! I recommend serving upside-down cakes warm. Serving warm not only brings out the flavor, but it cuts down on the total time this dessert takes. QUICK is always welcomed when you’re entertaining. Compared to most holiday desserts, this is literally a cake-walk. 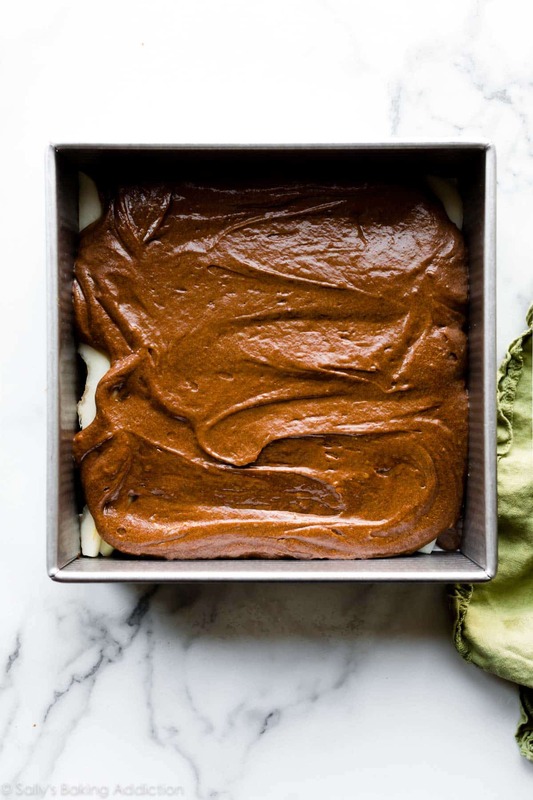 Prepare the topping: Lightly grease a 9-inch square baking pan. 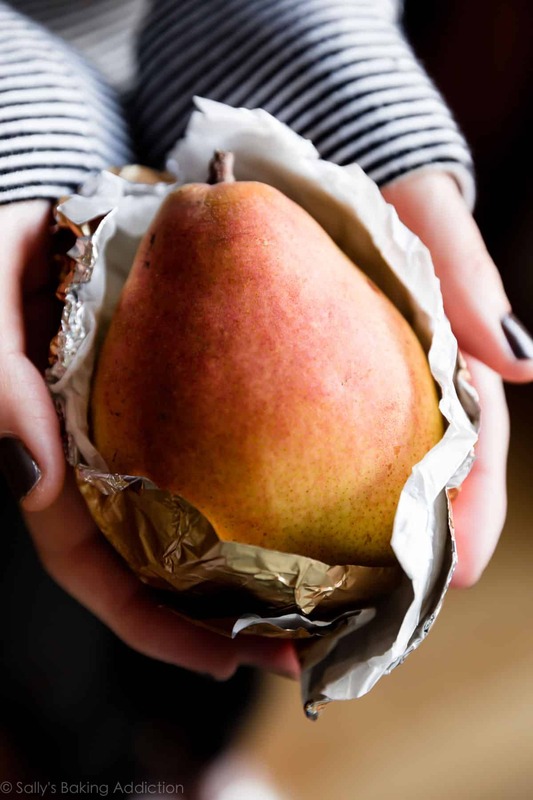 Peel, core, and slice pears into 1/8-inch thick slices. Tightly layer the pears in the prepared pan, as pictured above. Set aside. Whisking constantly, heat the butter, brown sugar, and cinnamon together in a small saucepan over medium heat. Once butter has melted, vigorously whisk to ensure the butter is not separating from the brown sugar. Once it comes together (it will, keep whisking! ), pour evenly over pears. Make the cake: Whisk the flour, baking soda, ginger, cinnamon, cloves, and salt together. Set aside. Whisk the molasses and hot water together. Set aside. Using a handheld or stand mixer fitted with a paddle or whisk attachment, beat the butter and brown sugar together on high speed until smooth and creamy, about 1 minute. Scrape down the sides and up the bottom of the bowl with a rubber spatula as needed. Beat in the egg and vanilla extract on high speed until combined, about 1 minute. Scrape down the sides and up the bottom of the bowl as needed. Turn the mixer off and add the dry ingredients and molasses/water. Turn the mixer on low and mix just until combined. The batter will be a little thick. Carefully pour/spread batter on top of pears. Bake for around 35-45 minutes or until the cake is baked through. To test for doneness, insert a toothpick into the center of the cake. If it comes out clean, it’s done. If you notice the edges or top browning too quickly, tent the cake with aluminum foil. Remove from the oven and allow to cool in the pan for 10-15 minutes, then invert cake onto a serving plate. Cake will be moist! Serve warm or at room temperature with whipped cream or ice cream. 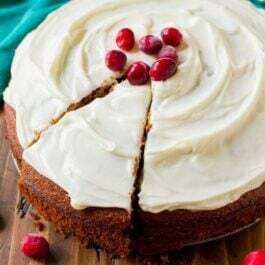 Cover leftover cake tightly and store in the refrigerator for 5 days or in the freezer for up to 3 months. Make Ahead Instructions: Prepare the topping in the baking pan, cover tightly, and store in the refrigerator for up to 2 days. It’s best to serve this cake right away; not ideal for making ahead. Variety of Cake Sizes: 9-inch square pan, 9-inch deep dish round pan (2 inch depth at least), 9 or 10-inch cast iron skillet, or an 11×7 inch baking pan. Bake time is around the same. Do not use a springform pan– topping will leak.